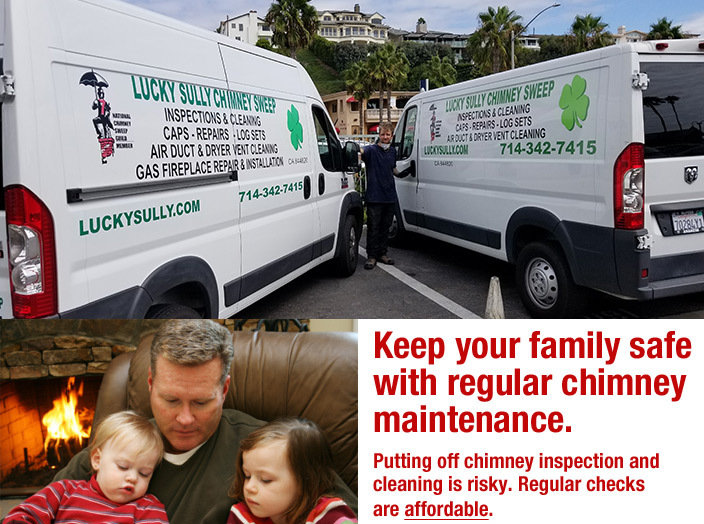 Welcome to Lucky Sully Chimney Sweeping and Cleaning. We have been serving homes and businesses for over 25 years. We are committed to giving you the very best in chimney and fireplace services. We are certified, licensed, bonded and insured for your protection. In addition, we are members of the National Association of Chimney Sweep Guild and Golden State Chimney Sweep Guild. LATEST NEWS: Ask us about our discount pricing for multiple services and/or products! Careful and thorough cleaning of chimneys, wood stoves, inserts, clothes dryer ducts. Troubleshoot smoke problems with your chimney. Thorough inspections of chimneys and fireplaces. Caps, spark arrestors and dampers. Sales and installation of gas and wood-burning inserts and stoves. Sales and installation of Fire-On-Ice products. Sales and installation of Glass doors. Sales and installation of fireplace doors, mantels, wood stoves, log lighters and many more products. Fire On IceTM is the best alternative to gas logs!